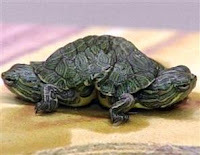 This conjoined turtle sure looks freakish. I guess the stronger of either will be the one forcing the direction the turtle is to go. I supposed Jay Jacoby, manager of of Big Al's Aquarium Supercenter, is right in that the turtle is not likely to survive life in the life. NORRISTOWN, Pa. - A two-headed turtle captured by a turtle collector is a rare example of a conjoined-twin birth, its owner said. The turtle would have likely died in the wild because it swims awkwardly and would be an easy target for predators, according to Jay Jacoby, manager of Big Al's Aquarium Supercenter in East Norriton. The store bought the tiny turtle from the collector for an undisclosed price and will keep it on display, he said. The 2-month-old turtle, known as a red-eared slider, fits on a silver dollar. It has two heads sticking out from opposite ends of its shell, along with a pair of front feet on each side. But there is just one set of back feet and one tail. Would you wear this hat? I'm a fan of PPP! Would you drive this car?